He is the second in a series of three De Khazens to become Maronite Patriarchs. The other De Khazens were Youssef (Joseph) Dargham El Khazen of Ghosta (1733-1742) and Youssef (Joseph) Raji El Khazen of Ajaltoun (1845-1854). 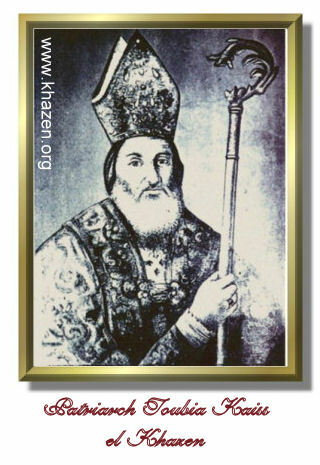 He is the Bishop Toubia son of Kenaan Kaiss , son of Abee Nawfal Nader , son of Abee Nader Khazen , son of Abee Safi Ibrahim , son of Chediaq Sarkis El Khazen . He was Ordained Archbishop of Cyprus in 1733 , became Patriarchal Vicar and then was elected as Patriarch in February 28, 1756 by consensus of votes, at Mar Youssef (St. Joseph) Church in Aintoura. 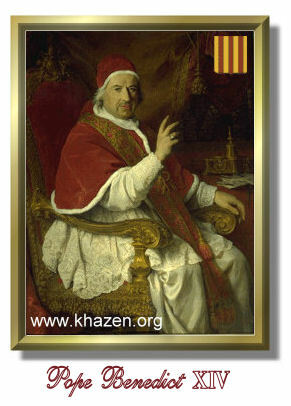 He established his residence in Keserwan and his election was recognized by Pope Benedict XIV according to his letter of approval dated April 30, 1756. He was one among only three Archbishops of Cyprus during Ottoman rule who were also elected Patriarchs over the whole Maronite Nation. The other two were Archbishop Estephan Dwaihi elected in 1670 and Archbishop Philippos Gemayel the Second, elected in 1795. He was also ordained Archbishop of Nablus in January 1, 1733. He was one of the founders of the Synod held in 1736 during the term of Patriarch Youssef Dargham El Khazen, signed as Archbishop of Cyprus. He was desirous to implement its decrees. To that end he called for a synod to be held at the Monastery of St. Anthony of Beqata in Keserwan in 1756. The Synod tried to bring about the division of the eparchies as decreed by the Synod of 1736. He was neither an adversary nor a close follower of Hindiyeh, whose reputation had increased and whose work was growing. Died on May 29, 1766 and was succeeded by Joseph Estephan of Ghosta.